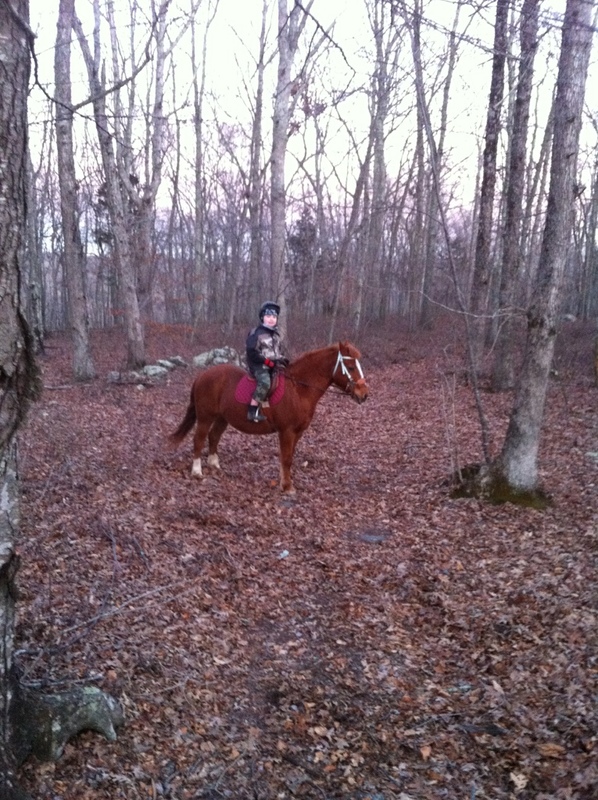 It was in the 40s this afternoon, so Alex and I took Precious and King on a trail ride. Our basic loop from the house takes about 40 min at a walk. It’s nice to have a riding partner. While I was the Engineer on USS Annapolis, Howard Craig was the Weapons Officer. We didn’t always agree on leadership techniques, but we were able to respect each other, and have healthy debates about life subjects. In fact, Clark Scharman (Navigator) and Matt Curitti (Supply Officer) used to join Howard and I in religious debates/discussions during private department head meetings. Throughout my tour, Howard always said something that stuck with me. “Everyone has something to offer. You just have to figure out what it is.” His point was, make a living doing what you love. In fact, he was constantly pushing me that our horses were what we had to offer, and we should be making money on our passion. Thanks for the inspiration Weps. Friends frequently ask us how we do so much on the farm. I usually answer, it’s just what we do. Everyone makes choices in life on how to spend your time. We don’t watch sports. We don’t watch much tv – in fact I think most shows glorify behaviors we are opposed to. We don’t go on big vacations to resorts. We do go outside every day. So do the kids. We teach our family about responsibility through chores. If the kids want to watch tv or play a video game, they usually have to work for the reward. Our kids understand where the chicken on their plate came from, they know rabbits in the cages, while fun to play with, will eventually be dinner. It doesn’t traumatize them; it educates them. Don’t get me wrong, I fully support everyone’s choice to live their own lives. In fact, if everyone had farms, we wouldn’t have customers. I’m just explaining our choice. Don’t ask how we do so much. Look at what you could have done instead. A couple of years ago, my sister-in-law Rebekah got us thinking about making bread at home. The were buying the wheat berries, grinding the wheat, and baking fresh bread. At the time we thought it was neat, but overly time consuming and cumbersome. Besides, what was wrong with the bread at the store? That was then. Now we have containers of red wheat and white wheat berries in the kitchen. Anna grinds the wheat and bakes bread. While she doesn’t bake 100% of our bread needs, she does try to make as much as possible. Last night we had pulled pork sandwiches on fresh buns Anna cooked right before dinner. This morning, we had banana nut muffins (with chocolate chips). Earlier in the week, we had cookies. We are able to control the ingredients, and know exactly what we are feeding our family. Not to mention, fresh bread makes the house smell great and tastes better! Thanks Rebekah for getting us started! 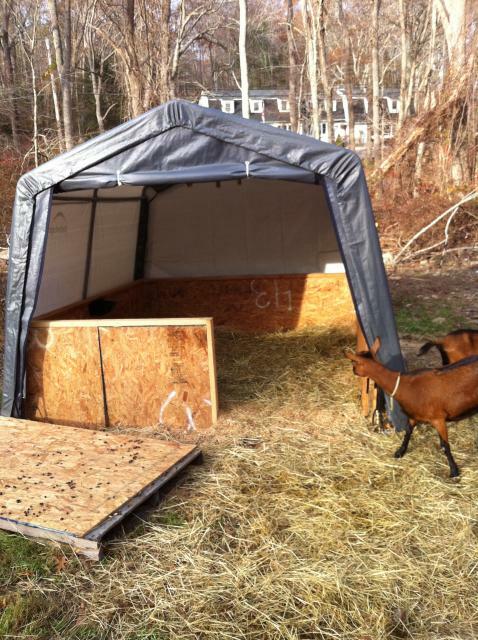 While we love to expand the farm, we try to do it on a budget. We have been focusing on recycling materials as much as possible. Why buy new, when you can find it used? Why buy used, if you can recycle something for free? Anna watches freecycle and I watch craigslist. Last weekend, I picked up 28 sheets of 1/2″ OSB for $100 from CL. I have found sources for 55 gal plastic barrels that just need to be washed out. There is a moving company that loves to give me a full truck load of pallets. Using pallets as the base for projects allows me to use the tractor with forks to move things around the farm. If you aren’t picky about paint colors, check the OOPS paint at Lowe’s or Home Depot for $5 gallons of exterior paint. 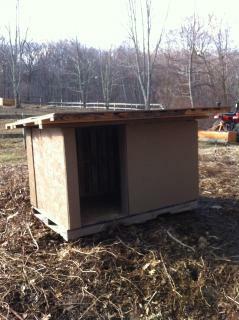 Here is the main shelter for our goats. It is a 10’x10′ Shelter Logic garage. I made a floor and walls out of recycled pallets. 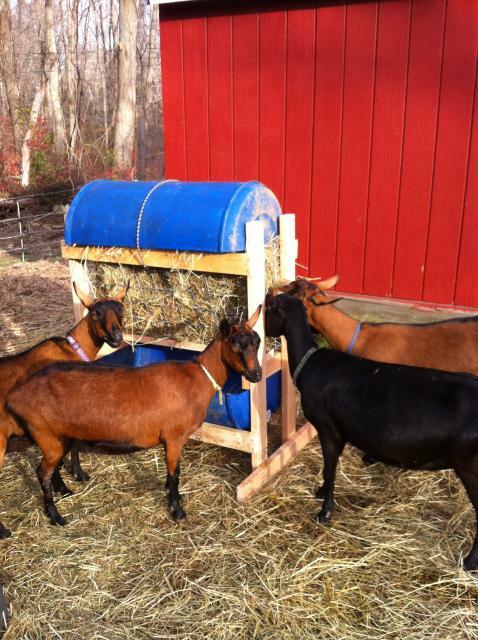 Finally, goats have to eat hay. Here is a hay feeder that I built using left over pieces of fence panels and a free plastic barrel. We have decided that we need a web page for our farm. It will take a while to transfer all the vision in my head to a computer, but we will get started. I expect most of the blogging will be done by me (Rob) but Anna will probably sit next to me and tell me what to write. Our main intent is to capture life on a modern, family farm. Also, we want to share what we learn to encourage others who want to do the same thing. Feel free to leave us comments and suggestions.